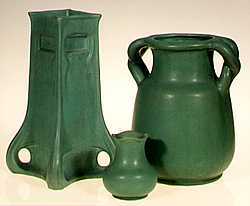 William D. Gates produced a line of pottery called "Teco" to provide well-designed Art pottery at a reasonable price. Talented designers, including Frank Lloyd Wright, were employed to create pieces that could be mass produced using assembly line principles. Large vases cost about $12.00, while smaller pieces sold for as little as $1.50. It was Gates' desire to place a piece of Teco in every American home.